At Master Mechanic, we want to help you get the most from your vehicle. We are a full-service facility ready to tackle any problem you and your car might have. More importantly, we get to know our customers and their vehicles over time to create a strong relationship that’s built on trust. We believe that informed customers are the most satisfied customers. With this in mind, we have created an interactive car diagram to help you stay informed. 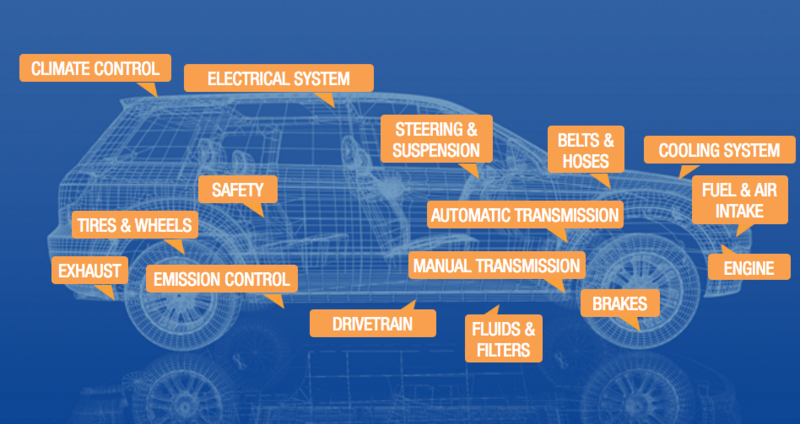 We encourage you to examine our car diagram, which includes information on the top 100 most serviced vehicle components. Among other things, your battery powers your starter and ignition switch. The troublesome thing about batteries is that they don’t always show warning signs before failing. This is why your battery and its connections should be checked at every oil change. To avoid unwanted surprises, it’s wise to change your battery after three years. Proper tire maintenance is vital to your safety. If your tires wear out they will not be able to grip the road, making slippery road conditions unsafe and dangerous. However, sometimes tire problems are simply due to bad luck. A flat tire is often the result of a puncture, which can happen to anyone. A punctured tire doesn’t always need to be replaced, but it’s worth having a professional repair done to ensure that your tire is not susceptible to failure later on. Also, remember to check your tire pressure often and while you do, inspect your tires for abnormal wearing. Eventually, everyone needs to replace their brake pads. How often you replace them will vary based on your driving style, where you live and what sort of vehicle you drive. Annual brake inspections will let you monitor their condition and schedule a replacement date. To prolong their life (and possibly yours) drive safely and carefully. By trapping dust particles, an air filter protects your engine and helps it run more efficiently. Ideally, have your air filters checked at every oil change to keep your car in top condition. If you frequently drive down dusty roads, you’ll find that you need to change the filters more often. Although your fuel pump requires no maintenance, you must replace them at the first sign of trouble. Your fuel pump regulates the volume of fuel delivery and has safety features to stop the pump in the event of an accident. A professional can usually spot problems quickly and keep your car running safely. If you smell exhaust fumes, hear a ticking sound when accelerating, or notice a louder than normal exhaust noise, you should have your car’s muffler immediately checked. These could be symptoms of an exhaust leak. In a worst case scenario, an exhaust leak could result in poisonous carbon monoxide filtering into your car. In this case, better safe than sorry. Now that you know more about these six frequently serviced areas, you can delve into our car diagram to become even more informed. We’ve designed our interactive car diagram as a useful resource for car owners, with additional information on how to maintain your car and optimize performance.